The Straddle Base TiltNRoll® allows the front and rear of the ladder to straddle any obstructions, allowing the user to climb the ladder in tight spaces. Durable gray powder coat paint finish is standard. The TiltNRoll® features a special balanced design that allows it to tilt easily to the rolling position when pulled toward the user. the user is not required to extend a foot to assist in tilting the ladder to the rolling position. 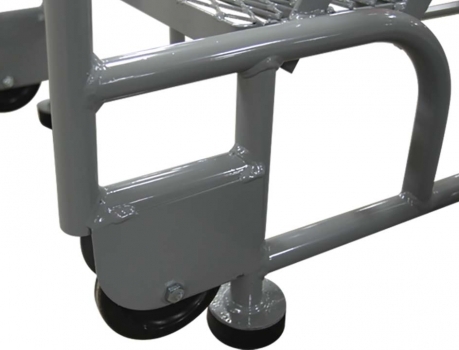 Once tilted, the ladder can be easily moved from job to job on the two 4″ diameter wheels. TiltNRoll® ladders are one-piece welded assemblies shipped ready-to-use. The ladders are supplied with handrails that extend 30″ above the top step. Rests on four 2-1/2″ rubber pads. 7″ deep steps with 24″ x 20″ platform. Gray powder coat is the standard finish. 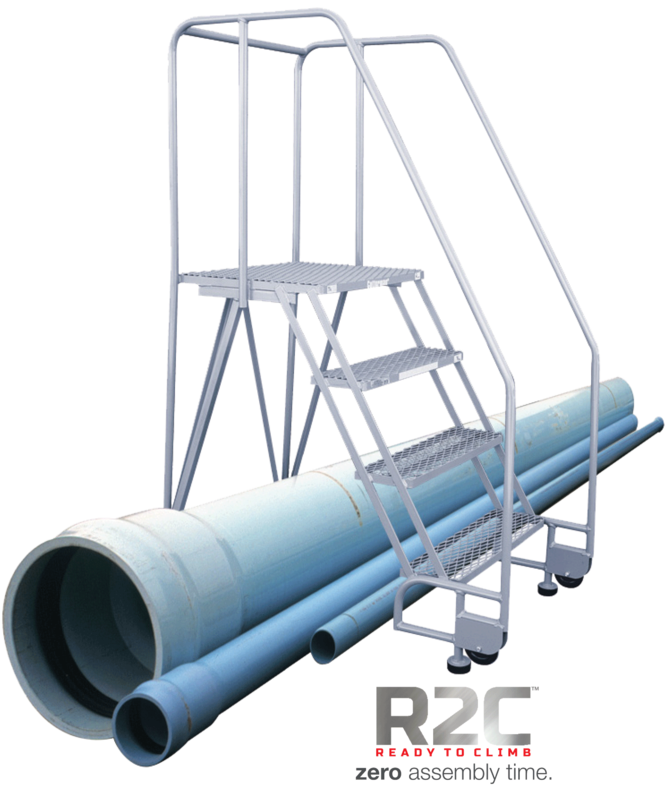 All tube members are 1” steel tube construction. 8 stairway tread support welds per step, for a stronger, longer lasting, and safer ladder. Cotterman® offers various tread widths to accommodate almost any situation. So, it is up to you, the user, to determine how and where the ladder will be most commonly used. TiltNRoll® steps vary in widths from 16″ to 24″ to allow for space, storage and usage constraints or requirements. is the approximate height that you would like to be able to comfortably reach. It is usually calculated at 5.5′ above the ladder’s platform height. is VERY important. You want to be sure that your ladder will not be too tall to fit into your workspace. This includes being able to fit through any doors that you may need to move it through, or under any ceilings or fixtures that you may have. is the measurement of the top step from the ground. It’s important that this measurement is not too far above or below your desired working height. is also very important because as ladders get taller, the base width increases. It is important to be sure that the ladder will not be too wide for your workspace. We offer different tread widths to accommodate most work areas. 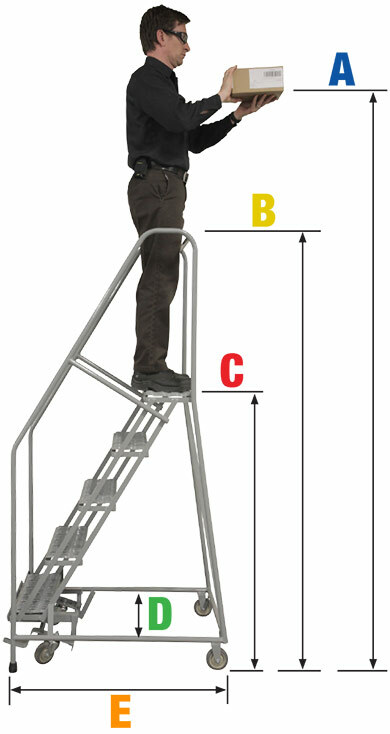 is the measurement of how long the base of the ladder runs. This is dependent upon the height of the ladder. The taller the ladder, the longer the base. Also lower climb angles increase base length. *Options such as deeper top steps are available, and will increase the base length. Top steps are available in 10″ – 12″(standard), 20″ – 24″, and 30″. Our NEW Product Selection guide can assist you in choosing the correct ladder for your application. Once you find the ladder that has the correct dimensions for you, just select the red model number, we’ll then ask you to select your tread type, tread width and platform depth. After that we’ll show you the model number(s) that is the best fit for your use.